This drawing depicts the fine detail on the gatehouse of East Barsham Manor. East Barsham is a fine example of an early Tudor brick-built house. Although the site originally dates from the 11th century, the existing buiding was erected by Sir Henry Fermor between 1520 and 1530. 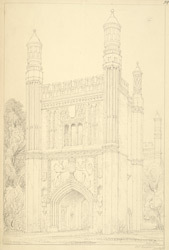 The gatehouse of the building, seen in this drawing, is adorned with royal Arms carved in brick. The long embattled front has grand buttressing and ornate chimneys, helping to give the house a tall and imposing presence. The interior of the house boasts fine early English and European furniture. It is believed that Henry VIII stayed at East Barsham on his way to the Shrine of Our lady at Walsingham.